Disease can be defined as any change in body processes that impairs its normal ability to function. The human body has certain basic requirements that must be met if it is to function normally. These requirements include the proper amount of oxygen, acidity, salinity, and other conditions. These conditions must all be maintained within a very narrow range. A deviation from that range can cause disease to develop. Most diseases can be classified into one of three major categories: infectious diseases; noninfectious diseases; and diseases for which no cause has yet been identified. At one time, a number of conditions were also classified as genetic diseases. This category includes conditions such as sickle-cell anemia, phenylketonuria, Tay-Sachs disease, cystic fibrosis, and galactosemia. These conditions are now more appropriately known as genetic disorders. At one time, humans were totally mystified as to the causes of common diseases such as typhoid, typhus, pneumonia, mumps, yellow fever, pneumonia, smallpox, rabies, syphilis, gonorrhea, tuberculosis, and rheumatic fever. Explanations ranged from punishment by God for evil deeds to acts of magicians or witches to an unbalance in the composition of the blood. During the eighteenth century, the true nature of such diseases was finally discovered. Largely due to the work of the French chemist Louis Pasteur (1822–1895) and the German bacteriologist Robert Koch (1843–1910), scientists learned that infectious diseases were caused by organisms that entered the human body and upset its normal healthy state. In most cases, these organisms were too small to be seen with the unaided eye: bacteria, viruses, and fungi, for example. In other cases, they were caused by various types of worms. Diseases of the latter type are usually called parasitic diseases because the worms live off the human body as parasites. The human body includes a number of devices to protect itself from infectious diseases. The first in line of these devices is skin. Skin can be thought of as a protective envelope surrounding the body. That envelope generally is able to prevent disease-causing organisms (germs) from entering the body. entering the body are able to invade the bloodstream through such openings. At that point, the body puts into action a second line of defense: the immune system. The immune system is a complicated collection of chemical reactions that release compounds that attack and destroy invading organisms. Without an immune system, the human body would become ill nearly every time there was a cut in the skin. In some instances, the immune system is unable to react adequately to an invasion of germs. In such cases, disease develops. The spread of infectious disease. 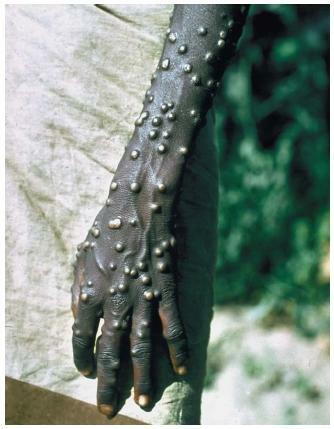 One characteristic of infectious diseases is that they are easily transmitted from one person to another. For example, a person who has contracted typhus can easily pass that disease to a second person simply by coming into contact with that person. Germs travel from the carrier of the disease to the uninfected person. Disease can be spread by many methods other than direct contact, such as through water, food, air, and blood. Waterborne transmission occurs through contaminated water, a common means by which cholera, waterborne shigellosis, and leptospirosis are spread. Foodborne poisoning in the form of bacterial contamination may occur when food is improperly cooked, left unrefrigerated, or prepared by an infected food handler. Diseases such as measles and tuberculosis can be transmitted through the air. Any time an infected person coughs or sneezes, infectious organisms can travel more than 3 feet (0.9 meter) to an uninfected person. Fungal infections such as histoplasmosis, coccidioidomycosis, and blastomycosis can also be spread by airborne transmission as their spores are transported on dust particles. Vectors are animals that carry germs from one person to another. The most common vectors are insects. These vectors may spread a disease either by mechanical or biological transmission. An example of mechanical transmission occurs when flies transfer the germs for typhoid fever from the feces (stool) of infected people to food eaten by healthy people. Biological transmission occurs when an insect bites a person and takes in infected blood. Once inside the insect, the disease-causing organisms may reproduce in the gut, increasing the number of parasites that can be transmitted to the next person. The disease malaria is spread by the Anopheles mosquito vector. Epidemics. Diseases sometimes spread widely and rapidly through a population. Such events are known as epidemics. One of the best-known epidemics in human history was the Black Death that struck Europe in the mid-fourteenth century. Caused by the microorganism Pasteurella pestis, the Black Death is also known as the bubonic plague, or simply, plague. Plague is transmitted when fleas carried by squirrels and rats bite humans and transfer the P. pestis from one person to another. Once it reached Europe from Asia in about 1350, the plague was virtually unstoppable. In some areas, whole towns were destroyed as people either died or moved away trying to avoid the disease. Over an eight-year period, an estimated 25 million people died of the disease. Other examples of epidemics include the worldwide spread of cholera during the mid-nineteenth century, the influenza epidemic in the United States in the early twentieth century, and the HIV (human immunodeficiency virus) epidemic in the United States beginning in the early 1980s. Protection against infectious diseases. When scientists learned the cause of infectious diseases, they also developed the ability to prevent and cure such diseases. For example, people can now be vaccinated as a protection against many types of infectious disease. A vaccine is a material that can be injected into a person to ward off attacks by certain disease-causing organisms. The material may consist of very weak concentrations of the organism itself or of dead organisms. The presence of these organisms in the bloodstream stimulates the body's immune system to start producing chemicals that will fight off the disease if and when it actually enters the body. In addition, scientists have discovered and invented a host of substances that will fight the germs that cause infectious diseases. The class of drugs known as antibiotics, for example, can be used to aid the body's natural immune system in combatting disease-causing organisms that have entered the body. Childhood diseases. 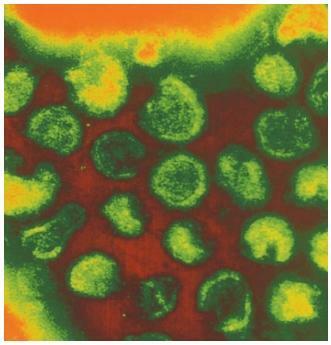 Chicken pox, measles, and mumps are all common childhood diseases. The term childhood disease is a bit misleading, however, since any one of these diseases can be contracted by a person at any age. The term developed simply because the diseases are much more common among young children than they are among adults. The diseases named above are all infectious, caused by a virus. They are generally spread by direct contact between an infected and a noninfected person, and since young children are often in direct contact with each other—on the playground, riding a school bus, or in a classroom—they are especially susceptible to such diseases. All three viral diseases have a somewhat similar pattern. There is a period of incubation, during which the virus reproduces within a person's body. Obvious symptoms then begin to appear: a rash in the case of chicken pox and measles and inflamed and swollen glands in the case of mumps. All three diseases normally disappear after a period of time, generally without leaving any long-term effects. Most children can now be protected against childhood diseases by means of a regular program of immunization (vaccinations). There are, as yet, however, few if any treatments for the diseases themselves. them. For example, it is known that a stroke occurs when arteries in the brain become constricted or clogged and are unable to permit the normal flow of blood. The brain is deprived of blood, and cells begin to die, causing loss of muscular control, paralysis, and, eventually, death. Your town is in a state of panic. Dozens of people have become ill in the past month with a disease that no one can recognize. You and your neighbors are worried that you too will become ill with the disease. To whom can you turn for help? This puzzle calls for the work of an epidemiologist. An epidemiologist is a scientist who studies the cause and spread of disease. The epidemiologist uses a number of sophisticated techniques in his or her work. One of these techniques is sometimes called source and spread. Interviews are held with people who are ill to find out those with whom they have recently come into contact. The goal is to find out from whom the person got the disease and to whom it might have been passed on. This pattern of disease spread is sometimes called a web of causation. Epidemiologists also try to track down the agent that caused the disease: a bacterium, virus, fungus, or other organism. They then try to determine how that organism has been transmitted from one person to another. By identifying the specific factors involved in an epidemic, it is sometimes possible to determine preventive actions that can be taken to reduce the occurrence of a disease. For example, it may be that everyone who has come down with the disease in your town has been swimming in the local lake. The disease can be prevented from spreading, then, by warning people not to swim in that lake. The techniques of epidemiology have also been used to deal with noninfectious diseases. For example, some epidemiologists have argued that gun-related accidents have many of the characteristics of an infectious diseases. They say that people who are injured by guns can be studied in much the same way as people who become ill because of a disease-causing organism. This idea is still relatively new, however, and has yet to prove its worth in dealing with such problems. Another noninfectious disease is cancer. The term cancer refers to any condition in which cells in a person's body begin to grow in a rapid and uncontrolled way. The causes of such growth are probably many and varied. For example, certain types of chemicals (known as carcinogens) can cause cancer. Certain kinds of tars, dyes, and organic compounds are known to be responsible for various forms of cancers. The largest single fatal form of cancer, lung cancer, is caused by chemicals found in tobacco smoke. Exposure to various forms of radiation are also known to cause cancer. People who are exposed to long periods of sunshine are at high risk for the development of various forms of skin cancer, the most dangerous of which is malignant melanoma. Some scientists also believe that some forms of cancer may be caused by viruses (which would make them an infectious disease). If a parent abstains from vaccinating her child from varicella and he/she develops chicken pox later will it be more severe? Is there risk for a stronger strain developing? Can you get vaccinated as an adult if it becomes more of a public threat?